You can also add a PDF, Word file, or other document directly to a page using our Embedded Document element (which is provided by a company called Scribd). We do not recommend the use of this element; linking to the documents as described in the guide above is a much better way to provide access to them. Linking to a downloadable PDF is usually the best, most professional way to provide finished documents to your visitors. If you’re not sure how to create a PDF, there’s very likely some free options for creating basic PDFs right on your computer. 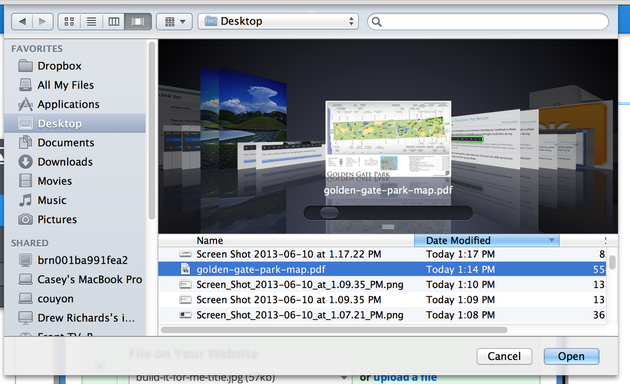 Click the indicated area of the element and the select the Upload new File option from the toolbox. Then select the file you want to upload from your computer. Give the file a little time to upload and you’re all done! 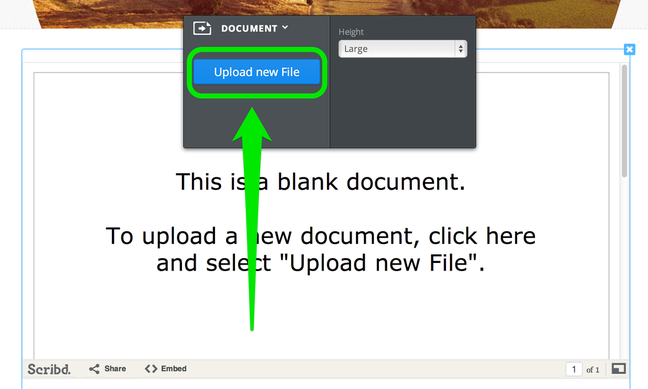 And we want to stress again that embedding a PDF or document in this way is not a normal thing to do on a website and you have little control over how the document looks once you upload it. ← Why is my content not displaying in DD Tab?